A master’s degree in gerontology can provide you with the ability to work in public policy, administration and public health, where you can study issues that affect the elderly. Sometimes it pays to learn about people who were born before the twentieth century and who survive today as supercentenarians — or, individuals who are over the age of 110 years. The following 15 individuals fall into that category, and these links can lead you to more information about these amazing people. Interestingly, only one person listed below is male, two are African American women, and six out of the 15 individuals were born and raised in Japan. Besse Berry Cooper, Caucasian female, was born in Sullivan County, Tennessee, the third of eight children on August 26, 1896. Cooper became Georgia’s oldest resident on January 19, 2009, following the death of 113-year-old Beatrice Farve. She is also the second-oldest verified person ever from Georgia, behind Gertrude Baines, who died in September 2009, aged 115 years and 158 days. When Enice Sanborn of Texas died on Monday morning, January 31, 2011, Cooper became the oldest person in the world until the discovery of Maria Gomes Valentim. Valentim died June 21, 2011, restoring the eldest person in the world title to Cooper. As of her 114th birthday, Cooper had 4 children, 11 grandchildren, 15 great-grandchildren, and 1 great-great-grandchild. Chiyono Hasegawa was born in Japan on November 20, 1896. Presently, she is the oldest living Japanese upon the death of Kama Chinen of Okinawa, Japan on May 2, 2010. Chinen also was the world’s oldest person at the time of her death. She is currently the 82nd oldest person on record as well as the 15th-oldest Japanese on record. Coincidentally, Hasegawa had been next to another Japanese woman called Chiyono in terms of rank until earlier this year. 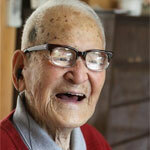 Chiyono Ohta, born November 1, 1896, had passed away on January 25, 2010 at 113 years, 85 days. Dina Manfredini, Caucasian female, was born on April 4, 1897, in Sant’Andrea, Italy. She came to America as a bride in 1920 and settled with her husband, Riccardo, in a tiny mining camp on the southwest edge of Des Moines, Iowa. Riccardo was 15 years older and had come to America first before sending for Dina. She cleaned houses until she was 90, lying about her age so people wouldn’t think she was too old to work. In addition to her four children, three of whom are still living, Dina has seven grandchildren, seven great-grandchildren and 12 great-great-grandchildren. Jiroemon Kimura was born in Kyoto, Japan on April 19, 1897 and still resides in Kyoto. He is the only male within the top 15 eldest people in the world and the third-oldest Japanese inhabitant. The previous Guinness world record for the “Oldest Living Man” was set by Walter Breuning of the United States, who was born September 21, 1896, and who died April 14th, 2011. He has seven children, of whom five are still alive, 14 grandchildren, 25 great-grandchildren and 11 great-great-grandchildren. Delma Kollar, Caucasian female, was born in Kansas on November 8, 1897. Originally, officials thought Kollar was born in 1898; however, in 2009, Robert Young, gerontology researcher for the Gerontology Research Group and senior claims investigator for Guinness World Records examined census documents to verify her claim, he discovered that several census records indicate that she was actually born in 1897, making her a year older than previously believed. Toshi Horiya was born in Japan on November 8, 1897. She is the oldest living person in Kagoshima prefecture since the death of Chikao Beppu on February 17, 2010. She also is the sixth-oldest living person in the world and the third-oldest Japanese person in the world. Leila Alice Denmark, MD, Caucasian female, was born in Georgia on February 1, 1898. In 1924, Leila Daughtry enrolled at the Medical College of Georgia as the only woman in a class of 52 students. In 1928, she was the third woman to graduate from the school with a doctor of medicine degree. When she retired in 2001, she was America’s oldest known practicing physician. She currently is the seventh-oldest verified living person in the world and the fourth-oldest verified living person in the United States. Kame Nakamura was born in Japan on March 8, 1898. She resides in Okinawa. Currently, she is the eighth-oldest person worldwide and the fourth-oldest living person in Japan. Marcelle Narbonne, Caucasian female, was born on March 25, 1898 in France (Algeria). On August 2, 2011 Venere Pizzinato died, moving Narbonne into the position of the oldest person in France and the oldest living person in Europe. 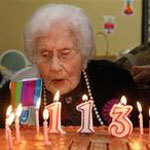 She is also the ninth-oldest person in the world. She and Marie-Thérèse Bardet (below) are the last 2 verified living French people born before 1900. Marie-Thérèse Bardet, Caucasian female, was born in France on June 2, 1898. 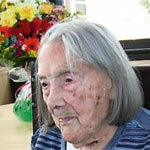 Currently, she is the eldest living French person and the 10th-oldest person living worldwide. Maria Luiza Nunes da Silva was born on July 7, 1898, in Portugal. As of August 14, 2011, there is one verified living supercentenarian: Maria Nunes da Silva age 113 years, along with one unverified in Portugal. da Silva has 12 grandchildren, 41 great-grandchildren, and 14 great-great-grandchildren. Mamie Rearden, African American female, was born in South Carolina on September 7, 1898. After the death of 113-year-old Mississippi Winn, Mamie became the oldest African American person in the country and in the world. Always active in church work, she has served in various capacities over the years. In 2008 her church, Springfield Baptist, honored her with a Mamie Rearden Appreciation Program. Chiyoko Asato was born on September 20, 1898 in Japan. She was reported missing in 2010, but it appears no other stories have validated her death. At this point, she is the 13th-oldest living person in the world and the fifth-oldest living person in Japan. Hagar Young, African American female, was born in Alabama on October 11, 1898. She is the second-oldest African American individual in the top 15, and the oldest living person in Alabama. Hiro Nakae was born on October 20, 1898 in Japan. There is nothing online about this woman, but through the record shown, she is the 15th-oldest person in the world and the sixth-oldest person living in Japan out of the top 15.